It’s always a challenge to figure out what to do for the first week of Spanish class. You never know exactly what your classes and student make-up will be. Here are some of the strategies that I use to survive and thrive during the first week of Spanish class. 1. Be really intense the first week. Start the first week of Spanish class with a serious, let’s get down to business, what we have to learn is extremely important attitude. With some classes, I pass out a list of everything that we’ll be learning in class for the year and have the students read each line aloud. Then I write the number of minutes of Spanish class that we have for the year on the board and say, “We have to learn all that information in ______ minutes. So let’s go!” (in Spanish, of course). This stresses the importance of every single minute in class and shows them just how serious you are. 2. Give homework the first night. Since many other teachers don’t do this, if you do, students will know right away that this teacher means business. And don’t give a fluffy, easy assignment. Give something challenging. After all, they won’t have that much other homework that night and they’re fresh off of summer and ready to go. 3. Be flexible and adaptable. My first year at a new school, I was given a class of 9th graders who had failed Spanish 1 twice previously. This would be their 3rd attempt. Yup, a whole class of students like that, every teachers’ dream. 4. Instead of letting the students focus on you, put the focus on them. I often make my 2nd -5th year students do presentations the second or third day of class (even if it’s something simple such as a paragraph describing themselves). For the best success, give them a structured paragraph with fill in the blanks (see below). Include a sample paragraph. At this point, if you give them free reign of what they’re writing and saying, they’ll make too many errors. The goal is to model the language correctly and have them to produce it correctly. If you assign this type of presentation, they’ll know you’re no joke. They’ll be so worried about doing the presentation that they’ll stop focusing on analyzing you and figuring out your weaknesses. That’s right – only show them your strengths the first week of Spanish class. You are a demanding teacher who is passionate about teaching languages and expects their best behavior and work. * There is a free copy of my Todo sobre mí project in the World Language Cafe Free Resource Library. Sign up to get access to it and to several other goodies. 5. 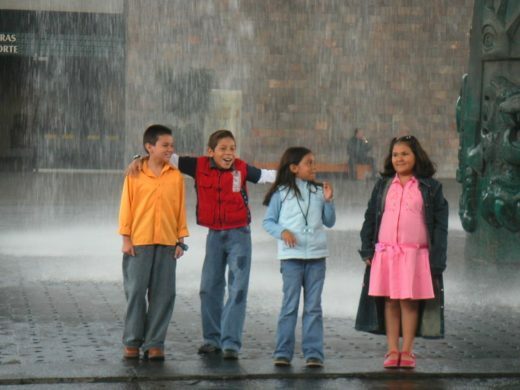 Show them why it’s so important to learn Spanish. This means the chances are high that you will be interacting often with Spanish speakers. This could be at your job, in your neighborhood, in and around your town, with your college roommate, or with your future spouse’s family members. Several of my former students have come back to visit and told me how important knowing Spanish was because they encountered one of these scenarios and were so happy that they were able to communicate. Research from Wharton and LEEG Europe shows that studying a second language correlates with an additional 2% more in annual income. (2) Not only that, but sometimes knowing that second language is what gets you the job in the first place. I know people who have applied for jobs with 50 or more applicants, and the hiring manager has said the reason they hired that person was because she spoke Spanish. Every adult I know wishes they knew Spanish. Tell your students to ask around and see what adults say. 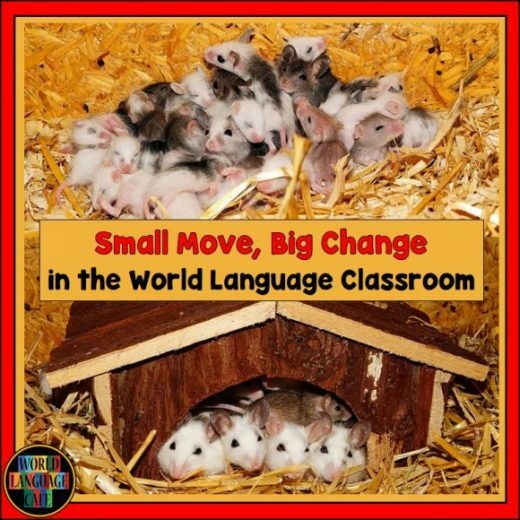 When I mention that I’m a language teacher, so many people say, “Aw, I wish I knew how to speak Spanish.” Tell your students that this is their chance to be better than the adults. This means you can talk to your friends in Spanish and your parents won’t understand. It can be your secret code. Write your text messages in Spanish and your parents won’t be able to read them. (Well maybe you don’t want to go this far because the parents might get mad, however it is a good way to get your students practicing Spanish outside of class). Perhaps just say that “other people” won’t be able to understand them. All you teachers out there, you got this! 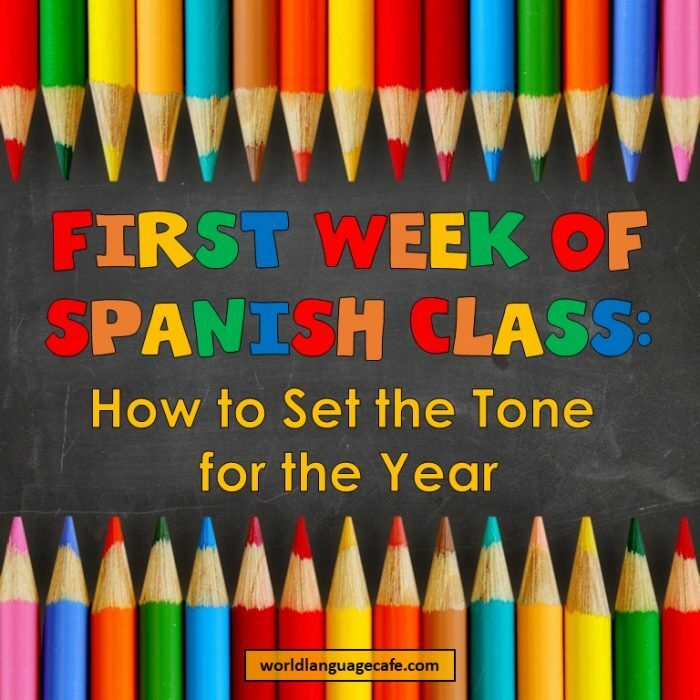 You’ll be amazed at the difference throughout the year if you set a strong tone during the first week of Spanish class. So much easier to start off strict than to try to recover part-way through the year. After reading this, are you still feeling nervous to go back to school? 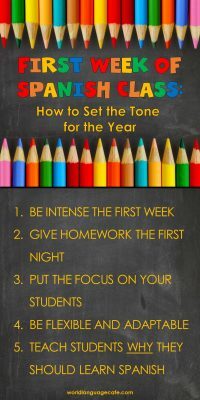 If so, check out my post about teaching tips to get excited for the first week of Spanish class. Remember to sign up below to access your free “Todo sobre mí” lesson plan for your student presentations. Free French, Spanish Lesson Plans!